Early in 19th Century, when it was not easy to navigate and calculate distance like the ready interacting Maps of Google today, The exploring minds of humans used the distance markers to keep track of the travel locations in Mumbai. Around 15 to 16 such Milestones were put up by Britishers in city that helped them while riding a cart, horse and other means of commuting. Between 1816 and 1837 (About 200 years now) most of these milestones were kept on the pathway and were prominently seen as they were installed about 3 to 4 feet above ground. Every basalt stone has a clear and big Roman numeral scribbled, like “V Miles From St. Thomas Church”. St. Thomas Church (Now Cathedral) which is located in Fort area of Mumbai (South) was marked as ‘Zero Miles’ and one of the some longest distance milestone was at 8 to 9 miles at Sion and Byculla area. Below references in KM, just for our understanding. 1 Mile equals 1.60934 Km. 15 to 16 of such basalt stone made structures were installed in early 19th Century, Of which 11 have been successfully tracked down. With development this rare monuments were been ignored, buried and lost their significance due to road widening, encroachment and other developments. As of now, Track down and restoration project is going on which will beautify, secure these milestones from further damage and encroachments and will be at prominent public visibility soon. The project is also going to link all this stones digitally with a newly made stone that will be places somewhere behind St. Thomas Cathedral marked as ‘Zero Mile Pointer’ which will detail locations and distance of other restored heritage milestones of Mumbai city. 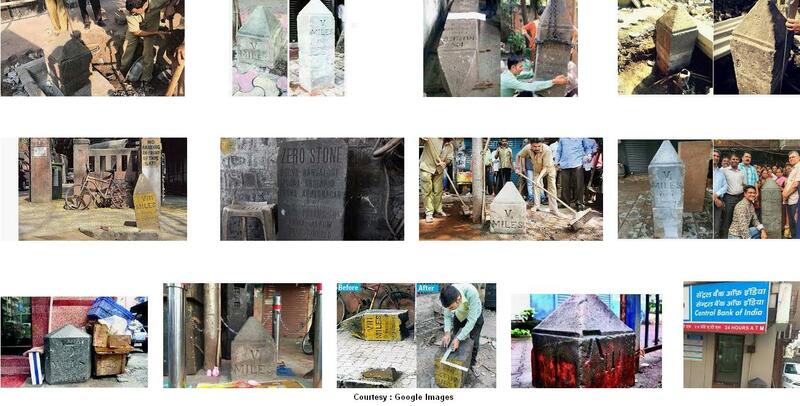 Citizens of Mumbai played a prominent role in pointing out the lost world of these direction stones and upon media interference and awareness, BMC heritage cell took up the task to find all of them to further secure these edifice and showcase. After going through all the online and news materials related to locations of these milestones, Below is what i have found. There may be some difference or incorrect which may soon be rectified once the project completes and final data is out. According to latest updates, 4 of these stones need to be tracked down and are missing (See below). If not found, Those remaining will be created and will have similar representative like the originals and will be places at the expected location it should be and will be linked digitally for future reference. Below are the locations where best to my knowledge and references online. I mile (1.6 Km) from Zero Point located at Edward Theatre, 514, Near Metro Adlabs, Kalbadevi Road, Marine Lines East, Tak Wadi, Lohar Chawl, Kalbadevi, Mumbai, Maharashtra 400002. II mile (3.2 Km) from Zero Point (MISSING) located Outside Union Bank, Null Bazar, Ibrahim Rahimtullah Road, Mumbai. III mile (4.8 Km) from Zero Point located at 15, August Kranti Marg, Papanas Wadi, Tardeo, Mumbai, Maharashtra 400036. III mile (4.8 Km) from Zero Point located at Bhatia Hospital, Javji Dadaji Marg, Tardeo Road, Old Chikalwadi, Tardeo, Mumbai, Maharashtra 400007. III mile (4.8 Km) from Zero Point (MISSING) located Opposite Bank Of India, Mazgaon Branch, Dr. Mascarehnas Road, Mumbai. IV mile (6.4 Km) from Zero Mile located at Blue Bird Bakery, 439, N M Joshi Marg, Arthur Road Naka, Chinchpokli (West), Mumbai, Maharashtra 400011. IV mile (6.4 Km) from Zero Point (MISSING) Opposite Voltas House A, Dr Baba Saheb Ambedkar Road, Ghodapdeo, Chinchpokli, Mumbai, Maharashtra 400033. V mile (8 Km) from Zero Mile located Somewhere near Patel Kardar Garage / Mahatma Gandhi Hospital, Dr. SS Rao Road, Parel, Mumbai, Maharashtra 400012. V mile (8 Km) from Zero Point (MISSING) at ESIS Bhavan, 108, Panchadeep Bhavan, NM Joshi Marg, Opposite Western Railway Workshop, Lower Parel, Mumbai, Maharashtra 400013. VI mile (9.6 Km) from Zero Mile located at Chitra Cinema, 198, Dr Baba Saheb Ambedkar Road, Dadar East, Dadar, Mumbai, Maharashtra 400014. VII mile (11.2 Km) from Zero point located at Dr Antonio Da Silva High School, SK Bole Road, Dadar West, Mumbai, Maharashtra 400028. VIII mile (12.8 Km) from Zero Point (MISSING) at Kataria Marg Junction, Ladu Jamshetji Road, Mahim, Mumbai. VIII mile (12.8 Km) from Zero Point (MISSING) wa originally located at a pavement opposite temple at Prabhadevi. It wa about 7 Feet tall. VIII mile (12.8 Km) from Zero Point located at Opposite Karnataka Bank, Tamil Sangam Road, Namdev Koli Marg, Sion, Mumbai, Maharashtra 400022. IX mile (14.4 Km) from Zero Point was found near a lake at Sion Chunabhatti junction by a student called ‘Gavin Martis’ of St. Xavier’s in 2012. (Milestone now preserved) at Dr. Bhau Daji Lad Museum, 91 A, Rani Baug, Veer Mata Jijbai Bhonsle Udyan, Dr Baba Saheb Ambedkar Road, Byculla East, Mazgaon, Mumbai, Maharashtra 400027. One of the Milestone was relocated to Colaba.